Life and leadership at the nexus of lean and zen. Examples of Excellence is a weekly feature showcasing examples of operational excellence. If you have an example you’d like to share, please email it to us. 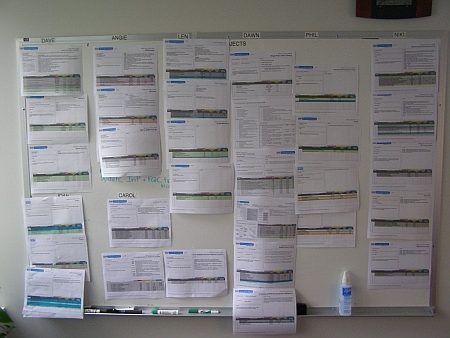 This week we have a photo of a board used to prioritize projects by department member. The project A3’s are arranged in order of priority, so everyone can visually see the status of projects and also where they sit in terms of priority. How does one see project status? I see various folks’ have several A3’s, but how do I know which have been completed? Perhaps some sort of flag (sticky?) could signal an A3 was complete, implying the individual had moved down to the next hightest priority task. © Copyright 2011 - 2016 Kevin Meyer. All Rights Reserved.